Antiques challenge. 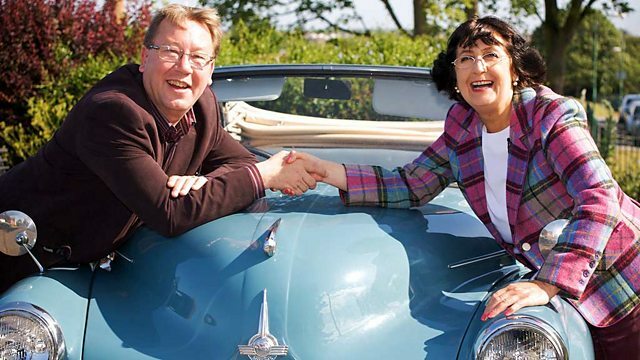 Anita Manning and David Harper are halfway through their trip. After a successful last auction, David has the lead, but Anita is hot on his heels. -Back in the game! Charlie! -So, will it be the high road to glory or the slow road to disaster? for David Harper and our canny Scottish lassie, Anita Manning. We're going north, Anita, we're going north! -Isn't that the pleasure of this trip? Seeing all these different landscapes. Buying a load of old iron as well whilst doing it. -Great! Don't you love it? -I could flog that dead easy. -of finding the golden dust in a bit of old rust. And do you know what, Tony? I am desperate to buy it if it's cheap. though she's not one to blow her own trumpet. -Do you think they'd let me into The Boys Brigade? -Er, I don't think so. in this positively delectable 1965 Morris Minor convertible. with both of them making whopping great profits. Our two expert treasure hunters started the trip with £200. Anita now has £318.65 to spend. David, meanwhile, has taken the lead with £385.86 for this leg. -Hey, I tell you what, have we got some money to spend or what? -We've got tons of dosh. I'm looking forward to seeing what takes your fancy, Mrs.
-Well, it won't be those bright red trousers. They're the same colour as my nail varnish! Otherwise known as "shocking" red. all the way to bonny Scotland and the town of Paisley. ending up at an auction in Newcastle-upon-Tyne. -I always aim to please. -Oh, and you do. You never fail. -OK. David, spend, spend, spend. -Don't you worry about that. See you soon. Anita is dropping David off at his first shop of the day. Crikey, those trousers really ARE bright. And tight. where she's catching up with her old pal, Yvonne. -Oh, Anita, lovely to see you. Lovely to be back to this wonderful treasure chest. They really are happy to be reunited. -Wow, I did not do that! I think that might take more than a second, Anita. Not THAT type of shopping. Just the type of thing that would go with David's trousers. Oh, please don't encourage him. Distractions over, Anita soon spots something she likes. -Can I see your scent bottle? -Right. I love these things. -I love them as well. There's no damage on the cut crystal. ..to cut all that into all these little triangles, squares and so on. And I've got that nice quality polished base. -..the fact that we don't have the stopper. but I dare say Anita will use that to her advantage. What's the very best you can do on that, Yvonne? that we've got that very important part missing. -What I'm looking at is round about the £30. -Mmm. If we said £35. Generous discount of nearly 50% off. where he's meeting dealer Colin. It's just an Aladdin's cave. It's an adventure. Soon enough, David's eye is drawn to a Mouseman cheeseboard. It's very simple stuff, isn't it? -for 10 or 14 years, I believe, until it's just right to be cut. And then they cut it and they use that tool - is it an adze? so the surfaces are never perfectly flat, are they? They've got that kind of wavy finish to them. And the old mouse there. which slightly varies depending on which craftsman was doing the work. -and is still running today. -OK, what about that baby there? OK, so this is a different animal altogether, isn't it? This is the cow stool. Tripod with that facetted leg, all hand-cut. because they're just off-centre and a little bit rough in places. -It's cos it's handmade, isn't it? This one's got more of a domed back, a bit fatter. behind how these mice came to be carved in the first place. and one of them said to the other, "Look at that. "Here we are in a church and we're as poor as church mice." And from that day on, they started carving mice onto the furniture. The combined ticket price of the two items is £210. -I'd stand a chance if that was £160 for the pair. -I cannot. Go on, try a bit harder. -I'll try a bit harder. Well, that's a very generous discount. It works out at £110 for the stool and £60 for the cheeseboard. Back with Anita and she's found something a little bit festive. -These old Christmas card printing blocks. -I thought they were good. -They're really nice, aren't they? -You know, that kind of old-fashioned Merry Christmas type of thing. that people could have good fun with. -You know, they could make their own vintage Christmas cards. -Is there more printing stuff? -There's those as well, Anita. -I think they're numbers as well. -Oh, look, that's for money. See all these together - who's going to want them except me? -Craft people. That's right, craft people. Er... Are these throwaway dead...dead cheap? The printing blocks are priced at £22. -I'll do them at £20 for the lot. -Could you do them all for a tenner? They're just daft things but I like them. I tell you what I'll do, I'll do them for £15. -You'll do them for £15? Another cracking buy, but there's still time for one more item. Er, I think it's German. I think it probably is German. Er, it has an Art Nouveau look about it. -It's got a bit of a mixture of styles. But I kind of like this crazy thing. -It's almost like a crab or a sea creature or something. And you've got these wee cherubs. with a ticket price of £48. -I mean, how much do you not like it? No prizes in guessing where THIS conversation's going. -so that I can take this out of your life for ever. It definitely won't be coming back? It won't be coming back, it won't be coming back. ..today, which is a tenner. Boys, you're coming home with me! Well, they're going to the auction. Put it there. -I've got three items and I'm delighted with them all. Anita's bought three cracking pieces for just £60. David, meanwhile, has spotted something a bit unusual. Right, what have we got in here of interest? What on earth is that? -Can I dive in there? Why on earth do you make a bike...? It's a novelty cigarette lighter. It reminds me of my ten-speed racer when I was a young boy. Not long ago. Ticket price for this fun little piece is £25. You've got wheels that turn, brakes that work... That's ridiculous! -You could get on that and ride off! Is that cheap? It's a fun thing. -Well, I think £20 and that is cheap for that. Thank you very much. Marvellous! Purchase number three. That's one shop down and three items in the bag for £185. to the coastal town of Hartlepool. In the 19th century, Hartlepool was an important ship-building port. at the beginning of the First World War. about this momentous day from curator Mark. bombarded the town of Hartlepool and West Hartlepool. came to the doorsteps of the working-class people of Hartlepool. and claimed the lives of 130 people. Over 500 more were injured. Wow. Local people had absolutely no idea. and the sound of thunder out to sea. Huge German 11-inch shells start falling on the town in huge numbers. -Something like 1,500 shells in about 40 minutes. coming in from the mist. No public warnings of the attack came until it was too late. By the time more help arrived, the Germans had scooted. but Hartlepool suffered the most damage. including some shrapnel from the attack, to show Anita. in some cases, faster than the speed of sound. and it just takes a building and turns it into matchsticks. and a shell hits the back of their house and completely demolishes it. in the rubble of the house. It had stopped at the exact time the bombardment started. But look closely. Where's the alarm clock made? It sounds like a day out of hell. the ordinary family on that terrible morning. and went either to find out what was going on or went to try to get help. hitting the streets and being outside. and tried to run off into the countryside. of the First World war on British soil. of what happened to Hartlepool on that fateful morning. But what effect did it have on the people of Hartlepool? Anger and fear to start with. into wanting to do something about it. What do you do? making shells in buildings like the one we're standing in now. of the people of Hartlepool forever. Ultimately, though, the community rallied together. 22,000 people volunteered for the armed forces. an incredible figure for such a small working-class community. and it took over a decade to restore Hartlepool to its former glory. of the world's first public steam-powered railway. He's hot to shop, with just over £200 to spend. Very good to see you. I'm loving those glasses! Tony's got an item he thinks David will like the look of upstairs. -Now then. It's a little bit industrial here. -Um, be careful, it's fairly heavy. And watch those trousers as well. Why, what's it going to do? Grab them? and, more importantly for David, a good chunk of metal. Oh, there's the mechanism. There's your gear thing, switch that. -Oh, I see, I see. So, that goes onto the hay? -And then lifts the hay bale. I hope you followed that. Now, I remember... You'll remember this. -Do you remember them, Tony, those days? You must remember, I put the first coat of primer on the Ark. Just like watching The Two Ronnies, isn't it? I mean, it is fabulous and do you know what, Tony? -I am desperate to buy it if it's cheap. 10 quid. Thank you very much. That is not worth negotiating over. because she loves all my bits of any old iron. but this last £10-buy marks the end of the first day's shopping. Time for some much-needed shuteye for our dazzling duo. Night-night. they're starting out beside the seaside. David, isn't that wonderful? Look at the sea, the wonderful North Sea. -in the north of England. And I'm so excited, I want to swim in the sea. Hmm, look out. You'd regret THAT pretty quickly. and an Art Nouveau mantle clock. Today, she has £258.65 left to spend. leaving him with just over £190 for today's shopping. a place that has a long history of maritime importance. It was here that explorer Captain Cook learned seamanship. -There we are, down there. -Delivered right to the door, just about. -Well, you're keen to get out. You almost flung yourself out the door! Is it the effect I have on women or something? -I'm looking forward to shopping. packed full of interesting artefacts to get excited over. There to help her is dealer Frank. or party set over here? -in that wonderful imari pattern. the rust-reds and golds and I like that. There seem to be some flaws though. I think that this is probably unassociated with it. -Bits have been brought together. -Uh-huh. And we've got a damage. -Uh-huh, I think that's a repair. Oh, yeah, that's a repair, yeah. I didn't notice that. -Has that been there for a long time? -Er, I shouldn't say, but it has. The item is priced at £150. So, what was you thinking of offering? -I'd be looking for round about £50. I tell you what. I could have a deal. How about £70? Would that be any good? -Could you come to maybe £60 on it? Has it been here for a long time? -It's a long time, yeah, so I'll have a deal with you. £60. -That's wonderful. Thank you very much. So, for £60, Anita is now the proud owner of a Derby part-tea set. in the history of the Royal National Lifeboat Institution. on how the RNLI functioned in UK waters. from curator and retired coxswain Pete Thomson. That's a fine model of a ship, Pete. What are we looking at? This is the famous Rohilla. She was a hospital ship with 229 people on board. basically from the front in the First World War. The people on board were mostly medical staff and the ship's crew. as, struck by a huge storm, it was swept off course. and the ship ran onto a mile-long rock known as the Whitby Scar. The impact split the vessel into three parts. and that's the way the rest of the town would find out. to a safer location position opposite the wreck. and then carrying it another quarter of a mile. She was dragged by several hundred people. so it was damaged before it actually left the shore. Those waters must have been absolutely hell on Earth. must have been a fantastic feat in itself. It took off the first 17 people and landed them back through the waves. Into the surf for a second time, and a further 18 people were rescued. and that's where we had to call for help from further stations. one motorised - tried and failed to help. And were people stuck on the boat? Were they in the water? No, the survivors would be mustered in around the wheelhouse. and trying to swim for it. wading into the water and pulling them out. Many, many died. In desperation, they just jumped over into the water and that was it. Time was running out for the passengers. and the storm was showing no signs of abating. -was called upon to assist. The final thing was to try and get a motor lifeboat down from the Tyne. which they did through the full storm and everything went well. They took our second coxswain and he then acted as pilot. and managed to get the last 50 survivors. -and were few and far between. "Now is the time to put a motor lifeboat in Whitby." So, the disaster then was a catalyst for change. that oars were no longer the ideal way for saving life. the only female stewardess on the Rohilla. having also survived the most famous shipwreck of all time - the Titanic. So, 100 years, certainly to the year, the trunk comes back. -I don't know whether Mary was lucky or unlucky. because of the severity of the weather. Titanic was huge but it was flat calm. So, her experience of the Rohilla certainly stuck with her. and its surrounding towns lives on. the highest honour of its kind. to another popular seaside resort, Scarborough. at Scarborough Antique and Collectors Centre. There she goes. -Pleased to meet you. I'm Matt. Lovely. Lovely to be here. The shop is brimming with Anita's Achilles heel - jewellery. Is this the bargain box? Yeah, I suppose that's where we've put a lot of the reduced ones, yeah. Yeah, like music to your ears, eh, Anita? -When they do come in, we'd rather not scrap them. -Nice wee lot, here, of four. We've got the little blister pearl here and I like those. -It's not a sapphire. I think it's just a blue gemstone here. ..and this pearlized stone here. -Four of them, all nine-carat gold, in the bargain basement box. The combined ticket price for the four brooches is £80. -so it's a kind of quick sale on four. -Tell me how you feel about that. Oh, hello, Yorkshire pot, meet Scottish kettle. -I could do them for £50, Anita. -£50? Could you take it to £40? -Could you take it to £40? -I...I think I could do £45 for you. You could do £45 on that? I think I'll go for that. That's lovely. -Thank you very much, Matt, that's wonderful. And with that, Anita has bought her final lot. He's visiting Eskdale Antiques, where he's meeting owner Philip. and a whole host of interesting objects to choose here. Little papier-mache 19th-century snuffbox here. -and bought for a few pounds? -Sorry, who are you talking to, David? But I love this because of the doggy on there. What's all this about? What do you know about this one? Nice little scene on the front - dog carrying its prey back, I think. Yeah, rabbit there, "To be delivered immediately" to its master. I love snuffboxes and I love the story behind snuff. -didn't they, so people couldn't pinch the snuff? -OK, what's the trade on that? -Um, I can do £25 on that. -Yeah, we can do £20. making his total spend on this leg just £215. and a 20th-century cast-iron hay grabber - as you do. a late 19th-century Derby part-tea set and four gold brooches. but what do they think of each other's purchases? but she knows these things inside out. £45 purchase price. There's gold in there. I think she'll do pretty well. I love David's Mouseman items. and the stool - isn't that such a delight? to an auction in Newcastle. Well, David, we're in sunny Newcastle. -..the clouds are parting, the sun is shining. -We'll be in our swimwear! There we go. And you can leap out...now. OK. Well done, David, well done. and wielding the all-important gavel this morning is Guy Macklam. I think the Mouseman items obviously stand out. They're always popular. with Mouseman furniture and collectables and things like that. so you're probably looking at less than £50 for that lot, I'd think. The auction's about to commence. Those two are unusually silent. First up, David's 19th-century snuffbox. 20 is bid for it. Any advance on 20? At £45. Down here, £50. At £50. To the lady at £50. Looking for some more here. At £50, all done. You should be. 150% profit. It's a great start! Next, it's Anita's numerical printing and greeting card blocks. -Here we go. Keep your fingers crossed. I'm bid £10. Madam, thank you. Any advance on £10? Go down the King's Road, wouldn't buy you a block. 12 bid. 15. Oh, come along. 15 offered. Right in front of me. Selling at 15. -It's yours, madam, at £15. All done. Are we quite sure? Wouldn't buy you a block, I'm telling you. 15, right in front. -Going at £15, all done. Time for David's cast-iron hay grabber. -Amway, let's go to the scrap dealer. -£10 for it or are we going to pass? -Oh, we've got it. 10 bid. At 10 at the back of the room, sir. Your money and it's away. -Back of the room, an offer at 10. All finished at £10. Selling at £10. So, a loss after auction costs and no sympathy from Anita. for Anita's Art Nouveau mantle clock. 10 is bid. Any advance on only 10? -At £20. Any advance at £20 for the lot? Selling at £20. Right-hand side, at £20. Are we finished? Think we are. Selling at 20. At 22. Not quite. -At 25 on the right, standing at 25. You're out, madam. -27 seated. All finished at 27. -All done. Sell for £27. -Oh, well done. Well done. -but how will his cheeseboard fare this morning? 10 bid. 15, 20, 25. At £25. Any advance on £25? £45 against you, sir. It's got to go. Looking for another 5. At 50 at the back then. Selling at 50. 55 at the back. 60. And again, sir. At 65. It's still a profit for David, but less than expected. Next, Anita's cut-glass scent bottle with the silver embossed top. 20 is bid. Any advance at 20? And again, sir. £50 to a lady at the back. At 60 in the distance then. Going away at £60. Gents are out. Selling here to a lady at £60, all done. A great profit, despite the missing stopper. -Two more each to go. -This is the telling section, isn't it? David loves his vintage bicycle lighter, but will anyone else? 10 bid. Any advance on only 10? At 10, 12, 15, 17. At 17 for the lot then. Nearer me then, at 17. -All finished at 17. You have it, sir. All finished at 17. 20 bid. Not quite. 22? 22. At 22 to a gent then. Quite sure at 22? Going to sell it to you, sir. I thought someone else was going to come in then. Sadly not. But every little helps, as they say. Will Anita's collection of four gold brooches do any better? -50 start. Any advance on 50? -At £130, lady at the back. £130. All out over this side. Looking for another £5. Selling at 130. You have it, madam. -Selling away now, at £130. That's a great profit for Anita and her beloved brooches. She's nearly tripled her money. -That's amazing. That is the best of the day so far. Up next, it's David's Mouseman milking stool. He spent a fair whack on this. Let's hope it does better than the cheeseboard. -You know I'm going to hold your hand, don't you? Start me at £100 to go. 100 bid. -Any advance at £100? At £100 for the lot. Any advance for the stool? At £140. -Looking for 160. Take a half, 150 bid. -At £150. Another £10 anywhere else? At £160. Yours in the middle of the room, sir, at £160. Selling away then, in the middle of the room at £160. -Well, that's all right. It's all right. Yours?! I'm surprised I'm still sat down. I thought I'd be on the floor by now! That profit has put David back in the game. Maybe Anita does have the magic touch after all. was her slightly damaged tea set. Listen, very best of luck with this one. -10 bid. 15, 20, 25. At £25. -There's still a long way to go. Come along. 25 offered. 30. 35. 40. At £40. Are you bidding, sir? 45. -50. 55, 60, 65, 70. -80. Now, it's £80, corner right has it. Any advance on £80 for the lot? -That's a lot of money for that. -That's a good, healthy profit. -I'm happy enough with that. And so she should be, considering how auctioneer Guy predicted it. It was a bit nail-biting at times. I think we need to lie down. David started this leg with £385.86. meaning he carries forward £422.60. Nice cheesy grin, David, thank you. Anita, meanwhile, emerges victorious. She started with £318.65. After auction costs, she has made an incredible profit of £90.84. with £409.49, she has won the day. That was exciting, David. Oh, thank you. -You know what, you deserve that. -You are my hero, Anita. Ready? -Get ready for another adventure, eh? ..while David sees something he really likes. Anita Manning and David Harper are halfway through their trip. After a successful last auction, David has the lead, but Anita is hot on his heels as they shop in Yorkshire and County Durham before heading into Newcastle for the auction.